We checked in well before the designated time, hoping to secure a room close to the front and therefore minimize our total step count of the vacation. The Desert Inn is virtually across the street from the east gates of the Disneyland Resort, an ideal location that would allow us to park the car upon arrival and not touch it for our entire time there — just walk back and forth between the resort and the hotel. Disneyland and Disney California Adventure were both open when we arrived, and clusters of weekend crowds were already streaming into the resort. Our master plan, however, called for a late breakfast at Knott’s Berry Farm after checking in, gambling on the hope that hotel guests would check out in the interim and we could find a better parking spot once we returned. 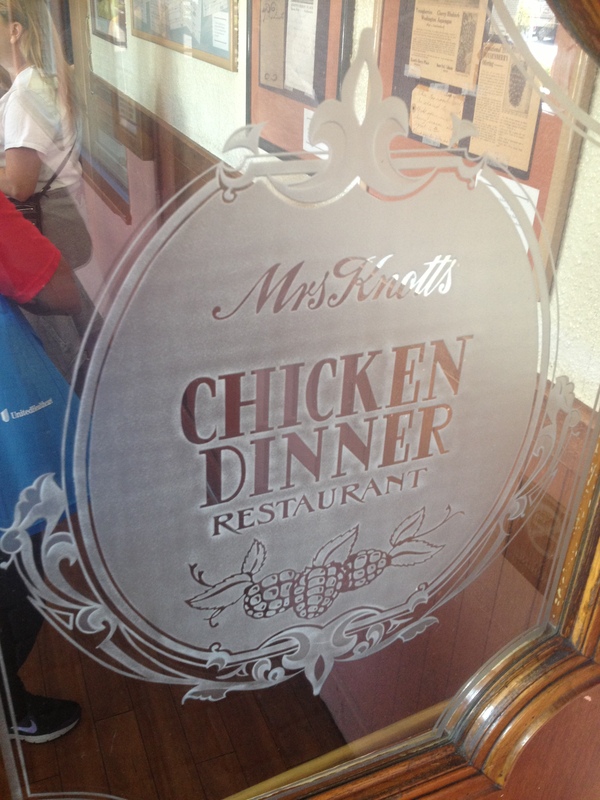 We drove to nearby Buena Park and Mrs. Knott’s Chicken Dinner Restaurant. My family has a long tradition with Mrs. Knott and her delicious fried chicken, having come here as a part of California vacations since before I was born. The entrance to the restaurant was, for all practical purposes, unchanged as far back as I could remember. The same familiar decorations hung on the walls, including framed guestbook pages with glowing reviews from long-irrelevant celebrities and politicians. These were the sort of names where, when standing in line with my grandparents as a little boy, they would point to and say things like: “I see that Victor Mature really enjoyed the boysenberry pie.” This meant nothing special to me at the time, and by now had three decades’ less cultural currency. A table was prepared for us within fifteen minutes. We did not take long to decide on the fried chicken and eggs breakfast, but our server had disappeared, and worse still, she had not yet brought us our biscuits. Each meal begins with a slab of Cordelia Knott’s famous hot biscuits, made from the original recipe (which I always imagine as a yellowed, grease-stained slip of paper with fading, scrawled instructions, kept in a locked drawer and brought out for the bakers to look upon with the reverence of a holy relic). Under ideal circumstances, the biscuits arrive steaming under a linen napkin, and with a selection of preservatives in small, plastic cups sealed with foil wrappers. A favorite of old-timey celebrities. We waited for what felt like hours for our server to return. We passed the time watching happy people around us eating hot biscuits smothered with butter and jam. Eventually, our server reemerged with apologies (and biscuits), and the rest of the meal was reliably great, with no further problems. Afterward we walked through two of the stores to warm up our shopping muscles – which all featured prominent displays of official Disney merchandise. Whether that was a weary concession or a sly strategy was not quite clear. Back at the hotel, our calculated gamble paid off as we found good parking spot, up front, and hopefully close to the room. We deposited our suitcases and bags in a massive locker and ran through our final mental checklist: Cash? Check. Sunglasses? Check. Motion sickness bands? Check. Disneyland Annual Passes? Check and check. We nodded at each other. It was time to cross the finish line. Disney California Adventure (we have learned to call it “DCA” from the Disney fan community; which can lead to blank stares from the uninitiated when I ask which rides they like in “Dee See Eh”) opened in 2001 with high hopes and expectations, and fell flat almost at once. Designed in one sense as a release valve for the intense crowd pressure in Disneyland, DCA opened with, by my count, one amazing, top-ten caliber attraction, two other decent rides, a bunch of filler, and a couple of terrible experiences. The theming, which is a crucial element to the charm and appeal of Disneyland, was spotty, being decent in some areas and awful in others. A critical component in the disappointment of DCA was in the displacement effect, where design elements (like the massive berm circling Disneyland) were devised to transport you out of drab, smoggy Anaheim and into A Whole New World(TM). This effect was notably lacking in Disney California Adventure, where entering was not unlike the equivalent charm of walking into a large warehouse. There were some interesting parts – the Golden Gate Bridge stands out in my memory – but on the whole it was more utilitarian than transformative. So, in 2007 when Disney announced a redesign and expansion of DCA, the entry area was high on their list of priorities. The price tag on the update was announced as a gag-inducing $1.1 billion dollars. I have not heard a reliable report on how much money was actually spent, but I am sure it would make me despair for the rising cost of park admission. We had already partaken in some of the expansion; our most recent trip was just five months prior, in May 2012. We had been on Ariel’s Undersea Adventure and eaten at Boardwalk Pizza & Pasta. We had beheld the spectacle of World of Color. We had been on Toy Story Midway Mania! so many times that I had all but forgotten it opened after the big expansion announcement. This trip was different, though. Walt Disney’s oft-quoted philosophy of “Disneyland will never be completed” means that a new experience in any of the parks (even creaky old Disneyland, which has been in more or less continuous operation since Eisenhower’s first term) is not unexpected. There is always something new to see, each time you visit. However, an entirely new subdivision of the park — a new land, in the park vernacular — is rare. The only time I could recall visiting a new land in a familiar park was when Disneyland’s Bear Country became Critter Country in 1988, which barely counts. Not only was that more or less just changing a few signs around, but I was also 12 years old and starting to discover girls, which was also a whole new world, to say the least. It was just a few steps to the intersection of Harbor Boulevard and the resort shuttle drop-off, where we joined a group waiting to cross. This was one of the two main thoroughfares into the Disneyland Resort, and because of that, there were always people walking it with us, every time of the day. The light changed and we crossed, walking down a broad pathway and through the security lines into the central esplanade. On one side we could see the Main Street train station behind the gates of Disneyland, and on the other, the new Pan-Pacific entrance to Disney California Adventure. The music – critical to the overall experience of any Disney theme park – was at full, engineered, presentation volume here for the first time (more on the music in a later post). The lines for both parks were short, being early afternoon, and we joined a queue for DCA. We handed our passes to the woman at the turnstile, grabbed park maps and daily schedules, and took our first steps into Buena Vista Street, the new entrance plaza for the park. Just inside the gates we stopped, slack-jawed, bug-eyed, looking somehow everywhere at the same time. On the left was a bright red old-fashioned gas station. Period storefronts stretched out parallel in front of us. A reproduction of Los Angeles’ Glendale-Hyperion Bridge spanned the street, and in the moment I was looking at it, the Disneyland Monorail zipped across. On the right was a rock and timber station for the Red Car Trolley, and to complete the absurd perfection of the moment, one of the rail cars was just pulling up. I would not have been surprised to see white doves flying through sun glories in slow motion. The first moments of awe passed, and then we broke into dueling streams of energetic gesturing and rapid-fire details. Look at those windows! Look at that ironwork! Listen to that music! The gas station is called Oswalds! That sign says “Eye Works!” I love the benches! I love the paint! I love the fruit cart! We meandered down Buena Vista Street, looking in the many windows of Elias and Company, the big store that stretched down the entire east side. 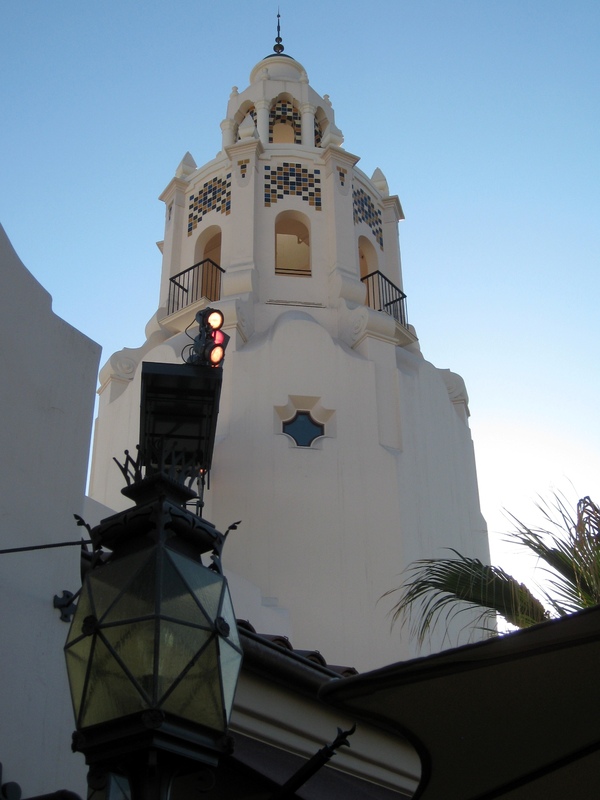 The Carthay Circle Theater loomed at the end, drawing our eyes, and serving a key role based on Walt Disney’s theory of theme park orientation. He called these attention points “wienies,” for some reason I can neither fathom nor discover (maybe when he is brought out of deep freeze and reanimated in 2066 someone can ask him). Having a Roaring good time! Get it? Roaring? Like the Roaring ’20s? No? Carry on, then.. In front of the Carthay Circle Theater was a multi-tiered fountain in blue tile and glass, which we paused for a few moments to admire. 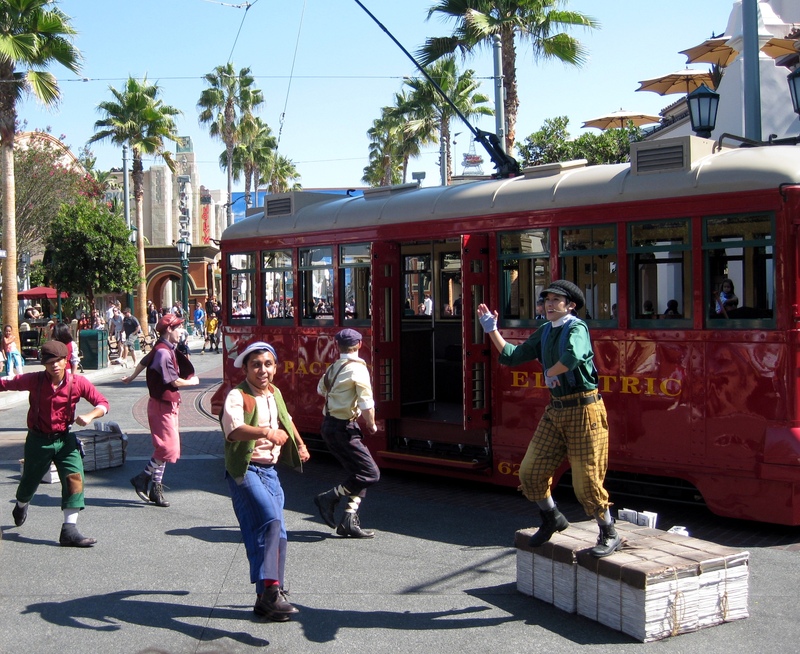 As we did, the Red Car Trolley stopped in front of the theater, twenty yards away from us, and a handful of performers in newsboy costumes spilled out for a quick song-and-dance. We sat down on the fountain and enjoyed the brief show, and then, as the car pulled away, Mickey, Goofy, and Pluto came walking out to greet guests. The characters were dressed in costumes evoking Los Angeles in the 1920s. Mickey stopped next to a bronze statue of himself and Walt Disney. I shook my head in disbelief. Our experience since entering the park seemed too perfect to be coincidental. Which, of course, was correct: it was both perfect, and not a coincidence. We considered staying on Buena Vista Street to walk through the stores, but an even more noteworthy destination was calling. We veered west at the fountain toward Cars Land, where we could already see the sign. We had expected crowds, being a Saturday, and we found one waiting for us at Cars Land, which had been crowded non-stop since the grand opening in June. The first thing I noticed was the long, multi-peak mountain range (was it the wienie of Cars Land? Is there a wienie in Cars Land? ), which sat at the far end of the land and housed the unquestioned feature attraction of the entire billion dollar construction project: Radiator Springs Racers. The second thing I noticed was at my feet: the pavement was black and spotless, and it was tempting to chalk it up to being new, but the reality was even more inventive. It was theming: Lightning McQueen had just finished laying it, according to the story. People were shoulder-to-shoulder across the tarmac, from the entry archway to the Radiator Springs City Hall. We shuffled along like the oblivious tourists we were, devouring the scenery and trying to fight off the relentless advance of sensory overload. We walked slower and slower as we went, in part because the crowd halted our pace, and in part because we could not absorb it quickly enough. Tow Mater’s place was across the street from Fillmore’s station which was next to Sarge’s store which overlooked the Cozy Cones which was located near to the Curio shop, which shared an intersection with Luigi’s and Flo’s V-8 Cafe. It was too much, but it was glorious. The universal first impression of Cars Land is that the place looks just like it does in the movie; this was true of every person in our group and several I have asked since. It is a 520,000 square foot masterpiece of design, engineering, and construction. It is a place where the storm drains read Radiator Springs, buildings are made out of traffic cones, and the Quonset hut is painted to look rusty. It felt so familiar that I constantly reminded myself (out loud, by the way, presumably exasperating everyone with me) that each grease stain, all of the wear on the buildings, every single piece of rock on the mountain range — was deliberate, recent, and man-made. In short: both Buena Vista Street and Cars Land delivered on their massive promises. They managed to exceed our lofty expectations, which was no small feat. The waiting time for Radiator Springs Racers, deep into Cars Land, was posted as 120 minutes. We were not on a schedule, and we were in DCA to experience the new lands, but we did not even consider the queue. Patience with crowds and waiting in lines are keys to a successful Disney Parks experience, but we could make use of the FastPass system later in the trip. Besides, waiting two hours for a five-minute experience seems like a special type of insanity. Even though I do it every once in a while. Instead, we debated lunch options. Neither of us were very hungry, the fried chicken breakfast still percolating in our stomachs, but it was growing later in the afternoon. Besides, there were too many things we wanted to eat at the Disneyland Resort to just willy-nilly skip a meal. Nearby was Flo’s V-8 Café. A “Counter Service” restaurant in the Disney Parks jargon, Flo’s V-8 Café serves diner-style food like hot roast beef, milkshakes, and salads alongside microbrew beers and wine by the glass. A middle-aged woman in a ’50s style diner waitress uniform stood at a register and cooed approvingly at our choices as she took our order. We ordered a Thanksgiving-caliber turkey dinner to share, along with a couple of Diet Cokes, and an apple-cheddar mini pie thing that turned out to be an absolute delight. There was a surfeit of seating at Flo’s V-8 Cafe, and we took our food outside to a long, covered patio that overlooked a zippy stretch of Radiator Springs Racers. It was an immensely pleasant interlude tacked onto an ideal afternoon. We strolled through the shops in Cars Land and Buena Vista Street on our way out. Amy and I are pretty easy marks for the mass-produced items the Disney Empire peddles to their guests. If there was a looming financial disaster on this Disney trip it was that the Subaru meant we did not have airline restrictions on space or weight in luggage. There was no practical limit to how many knick-knacks we could carry back home. This trip had the potential to get very ugly for our wallets. We managed to make it out of the front gates of DCA with just one purchase, which was a sleeve of gourmet marshmallows. We walked back across the street to the hotel to pick up our key cards and take our bags to our room. We were assigned room 222 on the second floor, in the back of the hotel, which meant that our early check-in scheme had not worked at all, and we would end each day with a longer walk and a flight of stairs at the end. We were stoic about it in the way that only first-world people on an extravagant vacation to a dream destination can be. On the plus side, our door opened to overlook a very skinny courtyard, which I found quite pleasant. The room was ideal for this Disneyland trip: comfortable, clean, and inexpensive for the area. We did not anticipate spending much waking time in our room, anyway, but our evenings after the park had closed would be relaxing. We set the air conditioner to start cooling the room – it was unseasonably warm – and unpacked our bags. Knowing we would be out until past midnight, we flopped onto the beds for a quick rest that turned into a solid afternoon nap. We woke perhaps a bit later than we would have liked (that whole “prodigious sleepers” thing) and freshened up to return to the parks for the evening. Some of the other groups in our travel party had come in, and we began texting plans for the evening. My Mom and Dad were in their room at a nearby hotel, but having driven all day were going to unwind that evening rather than come into the parks. My Grandma was staying with my parents, and would come over when they did. My younger brother, his wife, and their daughter were at the same hotel as my Mom and Dad. My older brother, his wife, and their two kids – also at the same hotel – were on a flight and expected in that evening. At a third hotel, farther down the street, were some close friends of the family. The Happiest Place on Earth. With pumpkins. The walking paths from all three hotels where our groups had rooms converged at the same intersection of Harbor Boulevard and the shuttle drop-off, and, as luck had it, we ran into our group there. My brother, Jake, his wife, Valerie, and their daughter, Jorja, were heading to DCA to gather first impressions of the new areas. Our friends: Rich, his sister Hydee, and Matt and Wendi, and their daughter, Dorothy, were starting off in Disneyland. We invited ourselves along with the Disneyland group. We presented our passes at the front gates near the foot of the Main Street train station, passed through the tunnel of the train berm and, in so doing, were transported to the familiar buildings and reliable atmosphere of Main Street, USA. The first thing I noticed on Main Street, USA – and I have to imagine it was the first thing anyone noticed – was a sixteen-foot-tall Mickey Mouse jack-o’-lantern sitting in the middle of Town Square. 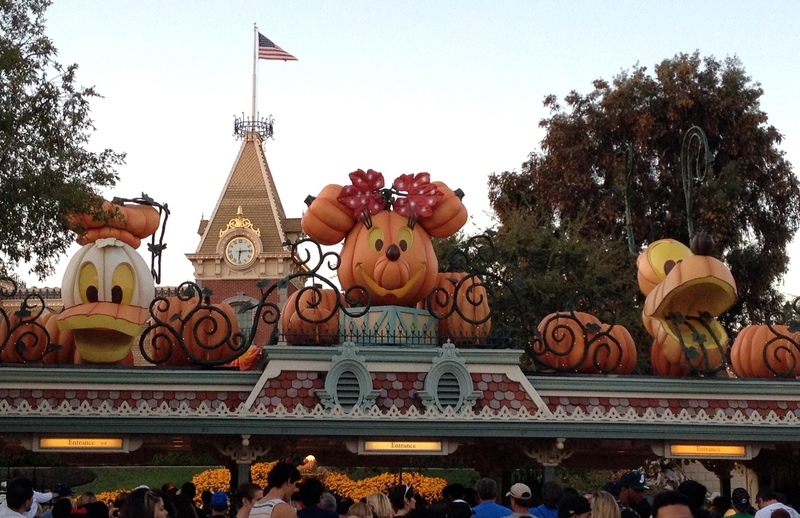 We had planned our vacation for during the Halloween holiday season, a time when Disneyland is accented with a modest smattering of jack-o’-lanterns and orange buntings. I should clarify: the decorations are not modest in execution (even an expert in understatement would struggle to describe a sixteen-foot-tall Mickey pumpkin as modest), but rather in scope, particularly compared to the Christmas holiday decorations that replace them in mid-November. The members of our group were learned in all things Disneyland; enough so that they could serve as amateur tour guides, should the occasion call for it (the possible exception was Dorothy, and that was not due to of a dearth of knowledge, but because she had recently turned two years old and was still working on speaking in full sentences). In fact, several of us had done just that in the past, accompanying loved ones with the intention of using our experience to add value to their trip. My first tour guide opportunity happened in 2002, when my parents generously took their kids on a summer vacation to Disneyland; which, of course, included Amy and I. It was her first real trip to The Happiest Place on Earth, if you didn’t count a single-day, motion-sickness-ridden fiasco when she was a teenager, which neither of us did. She had some misgivings as we made our plans, most of them revolving around how a group of people were going to have fun in Disneyland when the youngest of them was 22 years old. Her other concerns had to do with me and the emergent maniac Disney fan that I had successfully hidden from her through almost four years of marriage. For my part, I worried how to properly introduce her to a place that had held good memories for four generations of my family. As it turned out, neither of us should have been concerned. Amy, with her artistic sensibilities and eye for details, fell in love with Disneyland thanks to my guiding services (or so I liked to think). We followed up that 2002 trip with another in 2004, and have been averaging once a year since then. In 2012, we would ultimately make three trips to the park. I don’t know of a good way to determine this, but if I were called on to somehow rank which of us had a deeper adoration and appreciation for the Disney theme parks, it might not be me. We strolled down Main Street toward the Hub, making our plans for the evening with the casual argot of well-educated fans. We referred to the rides with simple, shortened names that enabled rapid conversation: “Pirates,” “Buzz,” “Small World,” “Peter Pan.” We understood the layout of the park in its entirety, without need to consult a map — if I had suggested we check the line on “Space” and then run over to “Splash,” the others would have looked at me as if I had been out in the sun too long. 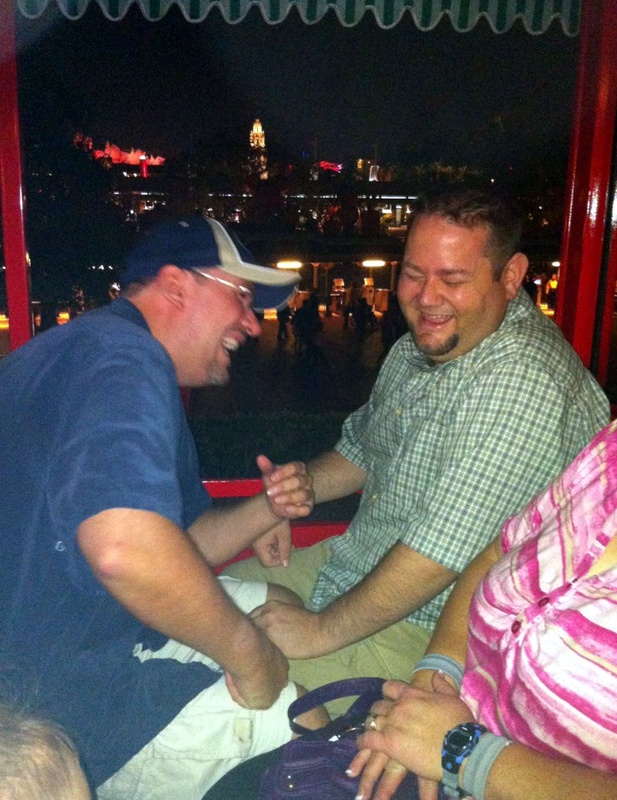 In hindsight, Rich and I probably weren’t having THIS much fun. It was late. The crowds were at their peak as we joined them, and so we spent much of our first few hours in the park just appreciating the evening lights and sharing our mutual awe that, after months of planning and anticipation, this very moment had arrived. The park was open late that night and we had an entire week ahead of us, so there was no urgent need to ride, eat, or experience anything in particular. At this point, we had been at the resort for close to eight hours split between the two parks, and had yet to go on a single ride. We had also enjoyed every minute of it. Friends who are not Disney fans love to ask how I can stand vacationing at the park for a week at a time. The answer is surprisingly boring: I just like being there. I like the theming every bit as much as the rides. I like the decorations as much as the weather as much as the music as much as the food. That is the philosophy that brings us back to Disneyland over and over again, and carried us through our first day: we just liked being there. We were pleased to just be with our friends and absorb the atmosphere. We ended up waiting in line for corndogs and chicken strips, and, once the heavy weekend crowds started to clear out, we did go on a few rides. As we walked back to the hotel after midnight, our feet throbbing through tired, shuffling steps, it felt like we were, at last, officially there. Loving the articles. My Disney nerd brain kicked on when you said that the last new land in Disneyland was Critter Country. What about Mickey’s Toon Town. That is a great catch, and my own Disney nerd brain is embarrassed that I forgot about Mickey’s Toontown. I’m glad you reminded me about that! There is a special magic when you are on Main Street. Its like waking into past, and wishing the past was not so far away. Almost like if all Main Streets were similar to this, that the world would be in a much better place. I totally agree — Main Street is a full of the elusive Disney Magic that always make me happier, anyway.